This is the new Contender peach, outlined against the post hole digger, ready to be planted. There were a couple of Reliance peaches, planted a year ago in May. Now there’s one. The mice girdled them last winter, and one died. We ordered the Contender to replace it. The tree was shipped potted and live. It came surrounded by polystyrene peanuts in a cardboard box. It was a relief to see the leaves and know the resurrected Reliance is really a peach. 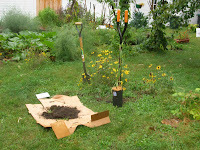 It was raining gently while I planted, but I gave the roots a good soaking with the hose, and mulched with cardboard and wood chips the next day. Behind the tree and its Blackeyed Susan friends, are -- left to right -- rhubarb, asparagus planted with clover, basil, pole beans, the tops of the tomato stakes, carrots, hops, dinosaur kale, Beacon apple branches, compost, marigolds, shell beans, more compost. The hanging pot is a weed we originally thought was a strawberry, and let grow to see what would happen. Lovely, hope it's grows and is abundant. So far, so good. Right now, my part is to get it protected before the snow flies.